According to research by U.S. News, these ten states have the lowest quality of life rankings. 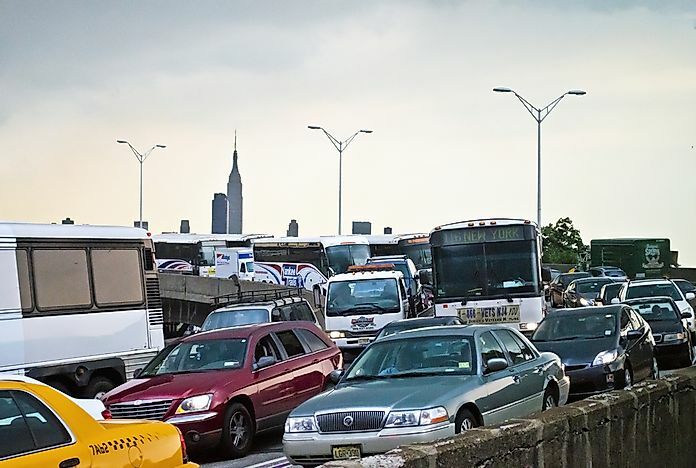 A traffic jam in Weehawken, New Jersey. New Jersey ranked among the US states with the worst quality of life. Editorial credit: Andrew F. Kazmierski / Shutterstock.com. An individual’s quality of life is affected by the natural and social environment in which the individual lives. Quality of drinking water, quality of air, and pollution are some of the measures used to evaluate natural environments. The quality of a social environment is determined by a study of the involvement of people in their communities by using community engagement and social support as measures. North Dakota is considered to have the best quality of life, whereas California has the worst quality of life in the United States according to US News ranking. California is ranked as the state with the worst quality of life. The social environment of the state is ranked at number 47, with a voter participation rate of 39.5% positioned at number 49. Community engagement and social support are ranked 44th and 38th respectively. The natural environment for California is ranked at number 44 with the state having a high pollution health risk. The state’s urban air quality is ranked last in the country with the ratio of unhealthy days to healthy days being above 0.15. The state of New Jersey is ranked at number 49 in quality of life, making it the second state with the worst quality of life. The state’s natural environment is ranked at number 32. The state has high industrial toxins with over 10 pounds per square mile of toxic pollution. Drinking water quality is ranked high at number 16 with about two violations per 1,000 residents. New Jersey’s social environment is at number 49 with social support being ranked 49th and community engagement at number 45 in the country. Indiana is number 48 in the quality of life ranking, with its natural environment at number 46. The quality of drinking water in Indiana is ranked at number 34, with close to 4 violations per 1,000 residents. Indiana has high industrial toxins of slightly above 10 pounds per square mile, ranked at number 45, and a higher pollution risk per capita which is ranked at number 48. Indiana’s social environment is ranked at number 43. The state’s social support ranking is 43rd in the country and a voter participation rate of below 50%. Illinois is number 47 in the country’s quality of life ranking. The social environment in Illinois is ranked at number 35. Community engagement in the state is poor and ranked at number 43 among the states of the US. The state’s natural environment was last in the country at number 50, having the highest pollution health risk per capita in all the states in the United States. The ratio of unhealthy days to healthy days in Illinois is around 0.03, giving the state’s urban air quality a ranking of number 44 among all the states. Some regulations have been implemented to safeguard how people relate to their environment. Some of the Acts implemented are the Clean Air Act for pollution, the Clean Water Act, and the Safe Drinking Water Act. These laws protect citizens from exposure to harmful toxins that lead to health issues which affect their quality of life.